The Bunny Bungalow: Happy Birthday Michael! 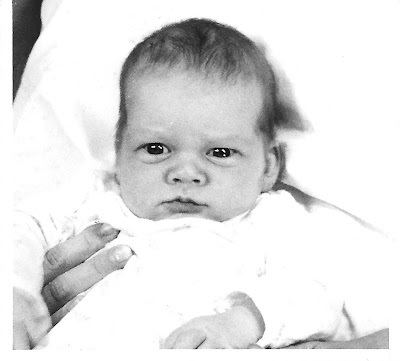 Michael at three-weeks old, posing for his first passport photo in Germany. On this day in history, you (still in utero) and I boarded a U.S. Army medical evacuation chopper for the flight to the Army hospital in Nuremberg, Germany. As previously planned, a team of Army doctors was also flying in to attend what they thought would be a difficult delivery. The night before the flight, your father, sister and I had gone to see what sort of chopper was on the landing pad in front of the small Army clinic in Hohenfels where we lived. The next day was your estimated date of arrival, so we were especially curious. We knew that any division training at Hohenfels was responsible for providing the medical evac chopper. We also knew that a division of the Bundeswier was training there that week. As we approached the area we saw it looming on the horizon: a small German chopper with external litters! As you know, I'm terrified of heights. Riding inside a chopper would be an act of bravery on my part; but to be transported on the outside of the craft with a tarp strapped over me was unfathomable! Sure enough, you decided to be on time. In the wee hours of the morning, your father drove me to the small clinic. As we approached the clinic, I averted my eyes. I just couldn't look at that mosquito of a chopper. Your father demanded that I look. There, waiting on the landing pad, instead of the mosquito, was a huge, new U.S. Army helicopter. You had the good manners to not be born on the chopper, though we were not certain we were going to make Nuremberg before you decided to arrive. The pilot had already radioed to determine your place of birth, should you be born in the air. There are certain moments in our lives together that are like freeze frames in my head. The first time I saw you is one of those moments. In the delivery room, as I was coming through a fog, I heard, "It's a boy! And what a boy!" I struggled to focus my eyes and saw that a doctor was holding up very large child with a gloved hand under each arm pit. I laughed, "OK, you guys, where did you get that toddler? You are such jokers!" But it was you; all 9.5 pounds of you, already grown to two feet tall! And you seemed to be giving me the same scrutiny you display in your first passport photo above. Though we dragged you all over the world and though I wish we had been better parents, you were a wise, realist of a child who turned yourself into a wonderful adult. You have always had a driving curiosity that has given you a passion for life. You have always been thoughtful, moral, ethical, truthful and intellectual in all things. And you have kept me laughing with your intellectual wit and your strange, but realistic take on the world. I am so glad you are in my life.